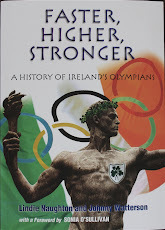 Irish Olympians - Faster, Higher, Stronger: Athletics: Good on Ya Pauline! Athletics: Good on Ya Pauline! Pauline Curley was all smiles after finishing the women’s marathon in 63rd place with a time of 2:47:16. “This was a real fairytale ending for me,” Pauline said. “The whole experience of getting a late selection for Beijing- having my mother,my husband Adrian and our son Emmet here, as well as so many of my extended family and friends from Tullamore Harreirs has been such a joy,” she said. Ireland's Roisin McGettigan finished a disappointing 14th with a time of 9:55.89 in the 3,000m steeplechase final. 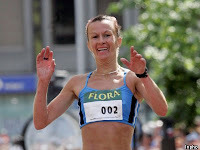 McGettigan struggled with the world record-breaking pace set by Russian Gulnara Galkina-Samitova who became the first women to break nine minutes for the event. Eunice Jepkorir of Kenya won the silver and Russia's Ekaterina Volkova the bronze. Russia has been accused of "systematic doping" before these Games, with seven athletes suspended, but these two - so far- have come up clean. Derval O’Rourke trailed home sixth in her 100m hurdles heat with a time of 13.22. Starting in lane eight, an unusually tense O'Rourke was false started at the first attempt and faded after 50 metres when the race finally got underway. In the second heat of the 400m hurdles, Michelle Carey was seventh in 57.99. OCI set up "crisis management sub-committee"
Irish Results Day 13; Katie Taylor Day! Boxing: Two Bronze Medals - At Least! Should We Fund Olympic Sport? Athletics: What's It All About? Boxing: Hopes of a medal? Where to buy "Faster, Higher, Stronger"